Reason to do this blog article is mainly to make a small archive with data around competitions. Predictions, time and ofcourse results. BTW: Todays session I was well packed with winterboots+ winterwetsuit+ cap, even some sun which really burned in my eyes downwind, GREAT. With some solid wind I burned enough energy to stay at good temperature. Soo there is hope for next weeks (lets hope months). Temperature of the air makes me feel like the water could be frozen during night soon, 8 degrees celsuis... CCCCCold!!! Interesting are the predictions for tomorrow, there is some good wind out there in the air. But the question is, will there be wind for speedsurfing?? Like today with every 15min another shower there is enough activity to bring wind to the surface. Also 2 days before this was the case, before every rain shower good wind (for 5 minutes or soo). 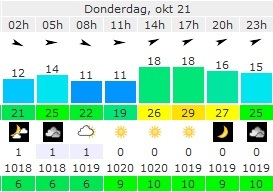 Yes I am not very positive minded lately, but sun without rain in the middle of the Netherlands at the end of the windsurfing season.... not the most successful combination for speedsurfing this week. NW-wind in this season is always giving clouds, showers and totally unstable polar wind (to give an example in the south of Belgium it's now snowing a little bit! ).